I don’t love rum, so why make a rum cake? Ever had one? They are moist and decadent and I couldn’t wait to try a healthy version. Just like with the Chocolate Fudge Pie, this was an experiment for my mama’s birthday and I can say that everyone around the table LOVED it, including the kids! If you’re concerned about the alcohol, it loses its effect during the cooking process and you’re just left with deliciousness! Try it and let me know what you think! Grease a bundt pan or cake pan. Add all ingredients (EXCEPT EGGS) to a bowl. Add yolks to all other ingredients and beat until well combined. In a separate bowl, add egg whites and beat until soft peaks form. Gently fold the egg whites into the other bowl of ingredients with a large rubber spatula until combined. Pour batter into pan and bake for 20-30 minutes or until golden on outside and toothpick comes out clean. 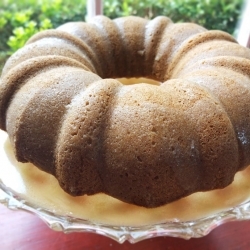 Cool at least 20 minutes and invert bundt pan onto a plate or other surface to release cake. Pour all ingredients into a small pot and heat on medium heat to a boil. Stir constantly for 3-4 minutes.